Display of your favorite small potted plants or other miscellaneous decorations on this stylish bamboo rack. This display stand features 2 tier bamboo wood slat shelves making it perfect for displaying outdoor patio items such as plants and gnomes display in the window, but it can also serve as a sweet indoor display stand as well. It is can as the kitchen Counter.Give this as a charming and useful gift for weddings and other events, or keep it in your own household to bring an elaborate modern edge to your decorations. 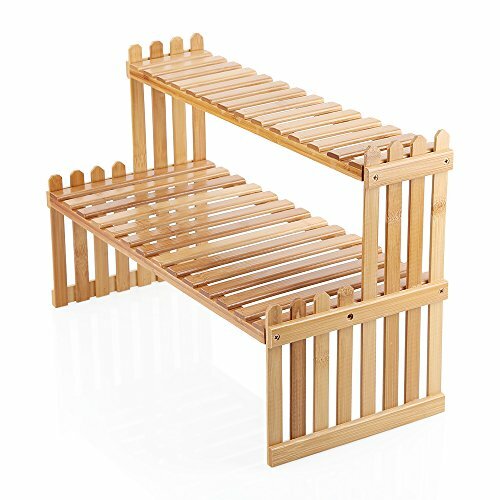 Features 2 tier slat shelves perfect for displaying small potted plants, books or other knickknacks. it help to people who are short on space and like to keep things organized. Perfect for displaying items on a desktop or tabletop/ window. And Very easy to put together. If you have any questions about this product by OGORI, contact us by completing and submitting the form below. If you are looking for a specif part number, please include it with your message.